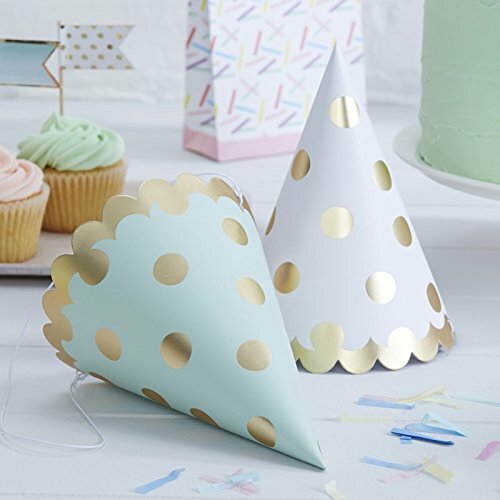 6 paper party hats, 7" tall with strings. 3 gold dots on white and 3 gold dots on mint. Matching paper plates and napkins available. Adorable for birthday hats. 6 paper party hats, 7" tall with strings. 3 gold dots on white and 3 gold dots on mint. Fun birthday party favors or baby shower favors. Matching paper plates and napkins available. If you have any questions about this product by Ginger Ray, contact us by completing and submitting the form below. If you are looking for a specif part number, please include it with your message.